So tonight is undoubtedly one of the games you circled on your Little Caesars schedule the day you got it. Stevie Y and the Tampa Bay Lightning are heading back to the Joe tonight, in what should be an excellent match up. Tampa has had a mediocre start after last season’s dream postseason run. Still, they find themselves only six points behind the surprising Florida Panthers for first, and have every right to believe they can win a weakend Southeast division with the unrest in Washington. But, instead of a lengthy preview on tonight’s match up, I thought it might be better to revisit my personal top three favorite Stevie Y moments. 3) So I’m cheating a little here because I am too young to remember this one. But I saw replay after replay of it growing up. My dad used to coach me to hang on to the puck in the offensive zone by referencing “that Yzerman goal”. This truly emobodied the forward he was in the late 80s and early 90s. 2) Yzerman’s performance on one leg in the 2002 playoffs is something I will tell my kids about one day. It was truly one of the most inspiring and gritty things you’ll ever see. Trailing 2-0 to the upset minded Canucks, Yzerman willed his team to victory that series. Despite his injuries, he ended the postseason with 23 points in 23 games. After winning the cup, he immediately passed it off to coach Scotty Bowman, who promptly announced his retirement. 1) Was there any question? I was fortunate enough to be at this game – on a school night (thanks Mom)- and will probably never be in a stadium atmosphere quite like this one. I’ll never forget the noise and beer that showered us as we listened to Tag Team’s Whoomp There It Is for what seemed like days after the goal. But it was just an amazing shot, and an amazing feeling. I’m having trouble putting it into words, but just ask any other person in that stadium that night, and they’d probably say the same. It will forever be included in top ten lists and highlight reels. As it should. Anyways, I’m sure I’ll get chills tonight. It should be a fun one, and hopefully the Red Wings can continue their winning ways. The Red Wings are back on top this week on ESPN’s NHL Power Rankings–well, they’re in the #2 spot…but since the Bruins are ranked #1 and we put an end to their winning streak on Friday, I think it’s a legitimate claim. I am confused by NHL.com’s Super 16 Rankings once again. Dave Lozo ranks the Wings at #4 behind Boston, Pittsburgh, and the NY Rangers. Forward Patrick Eaves will undergo surgery today to repair the fractured jaw he suffered Saturday night. GM Ken Holland said he expects Eaves to miss 6-8 weeks and that no roster moves are planned for the near future. Eaves had only 1 assist in 10 games this season after practicing with the top line for the majority of the preseason. The incident occurred with just over 2 minutes to play in the game. Predators defenseman Roman Josi, playing in his first NHL game, attempted to shoot a rolling puck on net. His blade met the puck on its side, causing the shot to lift up and catch the kneeling Eaves in the right ear. A very unfortunate incident given the time that it occurred. It should also be noted that Eaves had played his best game of the season Saturday, leading the team in both shots and hits. The Red Wings have endured a season full of peaks and valleys. They hope to stop the equally streaky Boston Bruins, who after dropping a third straight loss at the end of October have rallied with ten straight victories. The Bruins recipe for success has been a little bit of everything. They’ve won with excellent netminding from both Tuukka Rask (see 2-1 SO win vs Columbus) and Tim Thomas (3 SO on current streak). But the Bruins have also found the back of the net early and often, scoring 4 or more goals in 8 of the 10 games. Boston hasn’t beaten Detroit since a 4-1 win on Nov. 29, 2008. Zdeno Chara leads the way with an average of 25:22 minutes per game. Tyler Seguin, who is not yet 20 years of age, is a league leading +18 and on pace to score 50 this year. 25% of Todd Bertuzzi’s scoring last season came in the two games vs the Bruins. Despite his offensive stats being down, Henrik Zetterberg leads the team in SOG with 73, good for 14th in the league. This week was easy! Brad Stuart’s game clinching bank shot against the Ducks is our Top Shelf Tuesday Goal of the Week. I’m sure most Detroit Red Wings fans would agree that it is often times painful when our games are aired on VERSUS. Not only do I miss the normal crew, but the commentating and player interviews make me cringe. 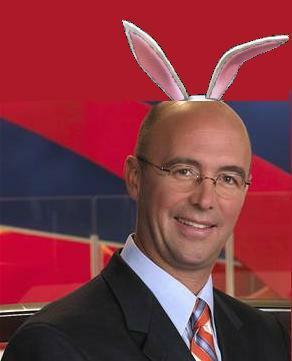 More specifically, Pierre McGuire makes me cringe. Some of the things he says make me crawl in my own skin and others are so ridiculous I can’t help but laugh. Greg Wyshynski from Puck Daddy posted “The 11 ickiest Pierre McGuire lines about Sidney Crosby’s return” this morning, which was absolutely amazing. It’s a must read. It was so inspiring that we’ve decided to make a season-long activity involving the creepiest lines said by the creepiest of the creeps (potentially) in hockey history. Submit your favorite/the most disturbing Pierre McGuire quotes or videos via twitter, email, or in the comments section below. We’ll post them and then have a vote at the end of the season for what best represents Pierre McGuire. "I'm a Puck Bunny hehe"
Have you all had a chance to see Dodge’s new TV spot featuring Johan Franzen?